Bluefin Labs | My "Marketing Nirvana"
While watching the broadcasts of the 2012 NBA Finals, I noticed the playoff teams’ Twitter addresses during aerial views of the baskets. 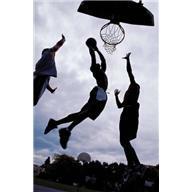 Social media engagement has been gaining momentum in the field of sports and has especially been a win for the NBA. According to AdAge’s Simon Dumenco reporting in partnership with Bluefin Labs, sports telecasts are uniquely suited to socializing via social media; benefiting from additional airtime and the propensity for tweetable action packed moments. Let’s not forget capitalizing on social media is a team effort, between the fans, the players, the media sponsors, and the NBA itself. Lillie-Beth Brinkman of NewsOK notes the fans posting at The Finals provide a personalized perspective, in effect offering us a courtside vantage point. Not to be outdone, this June marked the first presentation of the NBA Social Media Awards. Players and teams were showcased for achievements in social media engagement during the 2011-12 season, in such categories as most valuable team, Twitter trendsetter, and Facebook thumbs-up, to name but a few. So, are you a member of Team NBA? Which basketball franchises do you follow? Who’s your favorite NBA player? Share your thoughts on interacting with sports by way of social media.